There are plenty of places in New York City where you can go to get fresh juice, like Juice Press or Juice Generation. Everywhere you turn, you find a new trend or drastic juice cleanse to detoxify your body and reboot from the inside out. Why not incorporate juice into your regular routine, without depending on it to completely replace meals and flush out your body? 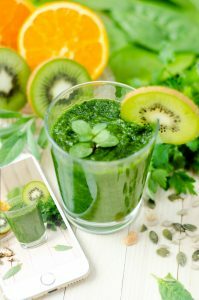 Juice unfortunately lacks the protein and insoluble fiber that would otherwise make it a sustainable meal, and a lengthy juice cleanse might actually deprive your body of all the nutrients it needs. As a supplement to your diet–not a replacement– juice can help you get the five to seven servings of fruits and veggies that your body needs, especially if you’re in a rush in the morning or on the go. It is best to make your own juice, so you can hydrate and stock up on antioxidants without taking in all the extra artificial sugars and high fructose corn syrup. You can make your juice in bulk for the week so that you can take it to work every morning in a reusable bottle or mason jar. Veggies on the go! Blend with whatever kitchen utensil you have at home! It helps to have a juicer, or a blender with a juicer attachment. Mary keeps it simple with kale, cilantro, parsley, water, and apple. Add a banana if you’d like! Find more recipes on Body and Soul, Australia. « Silica in the City!